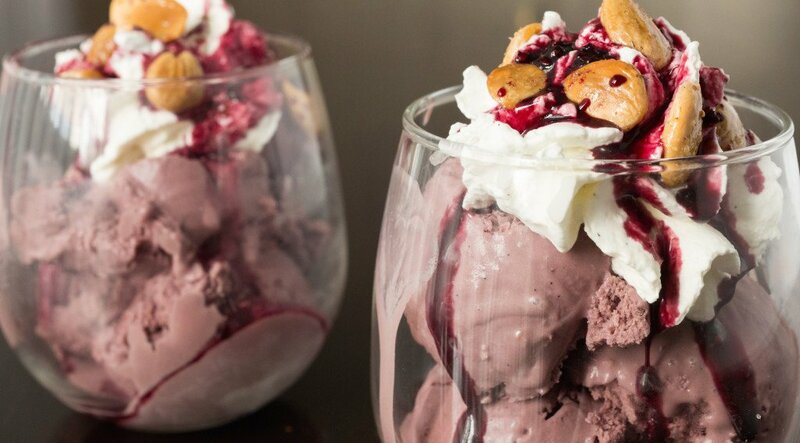 One of our most consistently popular posts is our Red Wine Ice Cream Recipe. As it turns out, people want more wine in their lives, and they would particularly like it in a form they can just shovel into their mouths with a spoon. As a little Valentine’s Day treat to myself and you all, I decided to kick that wine ice cream recipe up a notch and turn it into an ice cream sundae. Some ice cream sundaes you could virtually pile on any toppings and it would be delicious. But because we’re adults and this is wine ice cream, I wanted to very carefully select the extras. We’ll start with the creamy red wine ice cream base. Made with an entire bottle of red wine, brown sugar, real vanilla beans, a little cinnamon, and plenty of dairy. It’s sweet with a nice tang to it. Because the red wine ice cream is made with vanilla beans, I thought the best whipped cream to go on top would be simple a vanilla bean flavor. Really easy to make. All you need is some heavy cream, a little sugar, and a fresh vanilla bean. If you want it to be puffy and have the consistency as mine, you will need a whipped cream canister. If you don’t have one, you can still make it, your whipped cream just won’t be as stiff. I knew we would also need some kind of sauce or syrup to go on top. I honestly did think of making a homemade dark chocolate magic shell, but ultimately decided on a spiced red wine syrup. 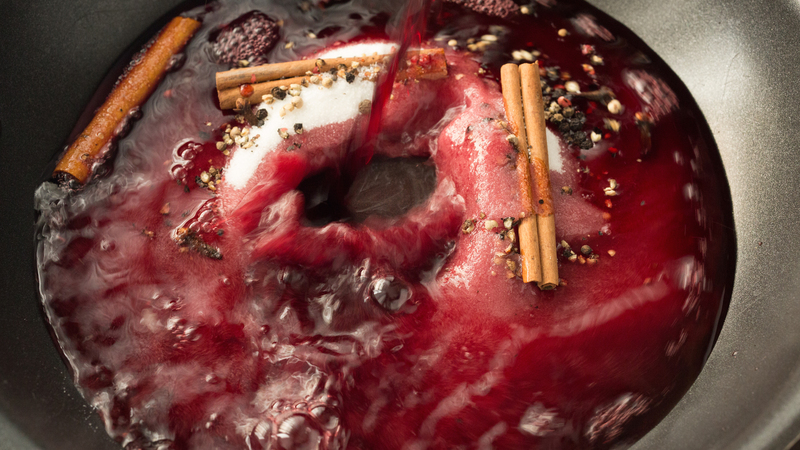 To make the syrup, you simply reduce a bottle of red wine over medium heat in a skillet with cinnamon and allspice. I think it would be excellent on most ice cream flavors, or even a cheesecake. When I was telling Janette the plans for this recipe, she was pretty quick to mention I didn’t have any nuts. While I don’t always love nuts in my dessert, she is 100% correct that they are imperative to an ice cream sundae. I really wanted something that would actually complement the wine ice cream, not just be thrown on to satisfy the nut requirement. The wonderful lavender almonds I had at a local wine bar, Ester’s, came to mind. 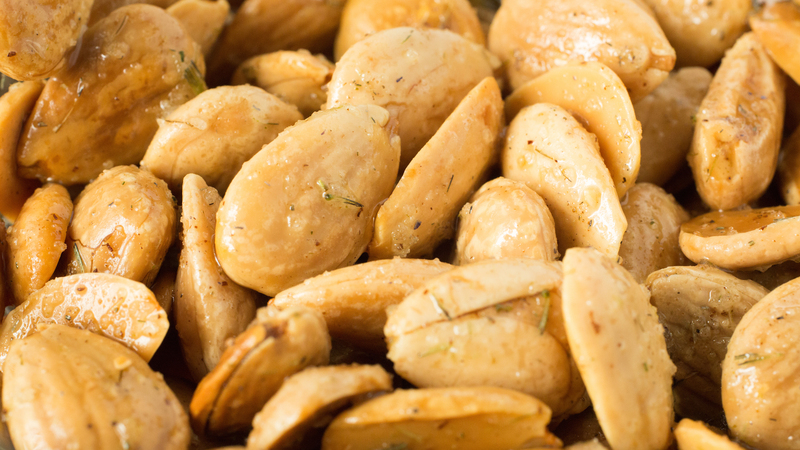 Marcona almonds toasted, drizzled with olive oil, then seasoned with salt, sugar, and dried lavender. 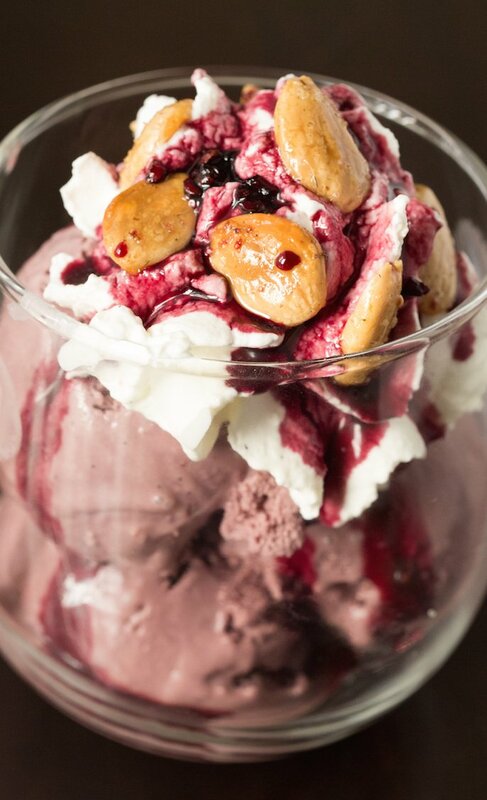 Uh yes, these are the perfect nut topping on our wine ice cream sundae. I left them whole, because I like big chunks in my ice cream, but feel free to chop them up into smaller pieces if that’s your thing. I put a few scoops of the wine ice cream in a wine glass, added the vanilla bean whipped cream, drizzled that beautiful spiced red wine syrup, then dropped on some of those elegantly delicious lavender almonds, took a bite, and was immediately transported to heaven. Seriously. If you’re a wine lover this recipe is a Valentine’s Day must, maybe even an every weekend must (we’re not here to judge)! Next time I make it I think I would add some cacao nibs and maybe add some blackberries in the wine ice cream base. If you do something different, let us know so we can try! Place a metal mixing bowl in the refrigerator at least 30 minutes prior to making the whipped cream. If using a whipped cream dispenser, place that in the fridge as well. Slice open the vanilla bean and scrape the caviar from the inside. Set aside. When cold, remove the bowl from the refrigerator add the vanilla bean, cream, and powdered sugar. If using a whipped cream dispenser, whisk together until just combined then pour in the canister. Follow whipped cream dispenser instructions. Otherwise, whisk with an electric mixer for 2-3 minutes on high, until whipped cream is stiff. In a large skillet, combine all the ingredients over medium-high heat. Leave uncovered and cook the wine down into a syrup. This took about 15 minutes for me. When it is thick enough to coat the back of a wooden spoon, it is ready. Place in a glass jar. When cool, store in the fridge. Using a mortal and pestle, ground the dried lavender into a fine powder. Preheat oven to 300°. 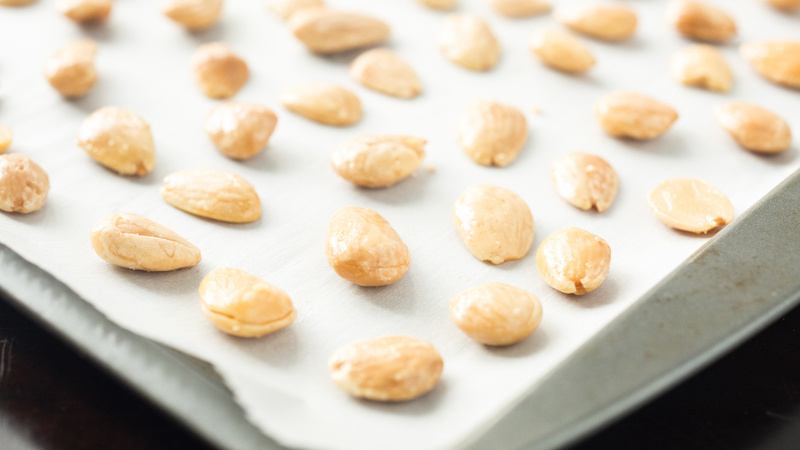 Place almonds in a single layer on a baking. Roast for 15 minutes, or until lightly toasted. Remove from oven and let cool. Toss the almonds with the olive oil, salt, sugar, and ground lavender. Store in an airtight container. 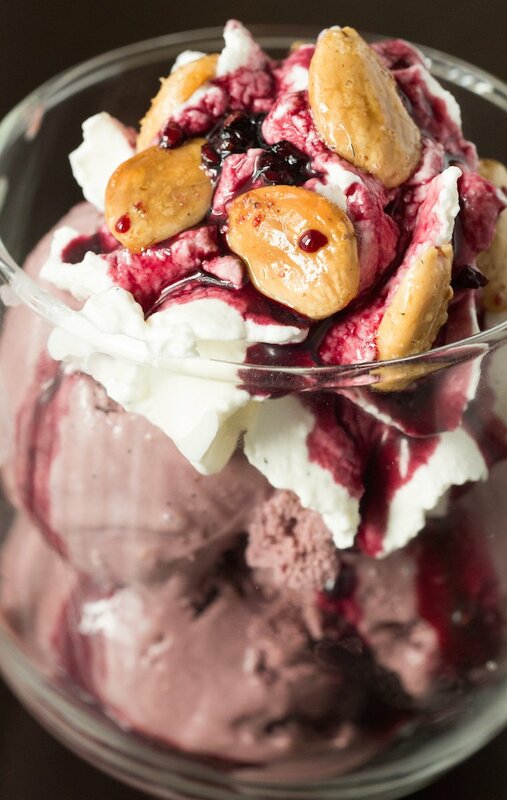 To assemble the sundae, scoop some of the red wine ice cream into a wine glass or bowl. Add the whipped cream, drizzle with spiced red wine syrup, and top with lavender almonds. Enjoy! Whaaat? This looks amazing! Ice cream + wine… two of my favorite things! Do I strain the wine sauce before jarring?